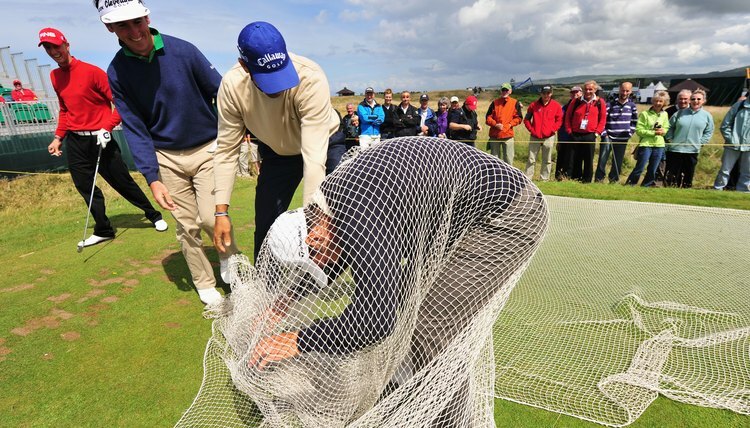 Improper use of a golf net can lead to disastrous results. Practicing your putting and short game without the aid of a driving range can be relatively simple. Finding free space to hit some full shots, however, is more challenging. Fortunately, a simple golf net allows a golfer to practice using his irons and woods, without risking property. While a more experienced player, capable of feeling clean shots, can benefit more, a beginner can still learn from a golf net. Set up your golf net in a safe place. While ideally all shots will enter the net, it is best to find the least risky area in the event of a miss. Stick a strip of impact tape to the face of your club. Place a ball, and your hitting mat if you're using one, as close to the net as you can without jeopardy of hitting the net with your swing's follow-through. Address your ball as you would on the course. Don't allow the fact that you are not paying for balls, like at the range, to cause you to rush your shots. Take five to 10 shots into the net. Listen to your shots, to hear how the ball is coming off. Watch your shots' trajectories. While it is hard to tell a great flight path from a good one in so short a distance, you can tell if your shots are spraying left or right, or staying too low. Examine the impact tape on the face of the club. A consistent spot on the sweet spot is a good sign. A consistent spot off the sweet spot will call for adjustment to your swing path. Marks all over the tape means your swing is out of control. Continue using your net to increase the positive signs in Steps 6 through 8.